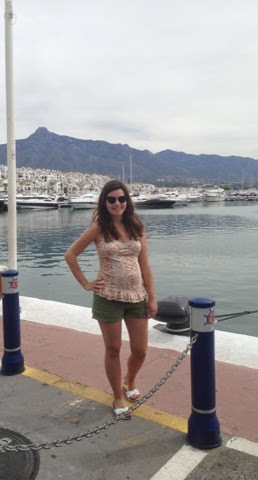 Today we went set off to Puerto Banus for a look around. I wore shorts and top again, neither of these were maternity. The shorts were from urban outfitters aaaages ago. I think I bought them in Urban Outfitters in America on a holiday there. They say they are a size 10 but they must be a big size 10! The top is old as well I’m not sure where this came from. The label says ‘international’ so who knows! The top is a size 10. We visited an epic American diner called Jacks for lunch, that Nick and I had been to on our first ever holiday together over 6 years ago. It did not disappoint! As we had such a big lunch we weren’t that hungry later on so we didn’t bother to get changed and just ambled in to La Cala de Mijas for coffee and churros that night.